Residents of North Minneapolis now have one more wholesome resource to dispel the image of a food desert: The Twin Cities Mobile Market (TCMM). 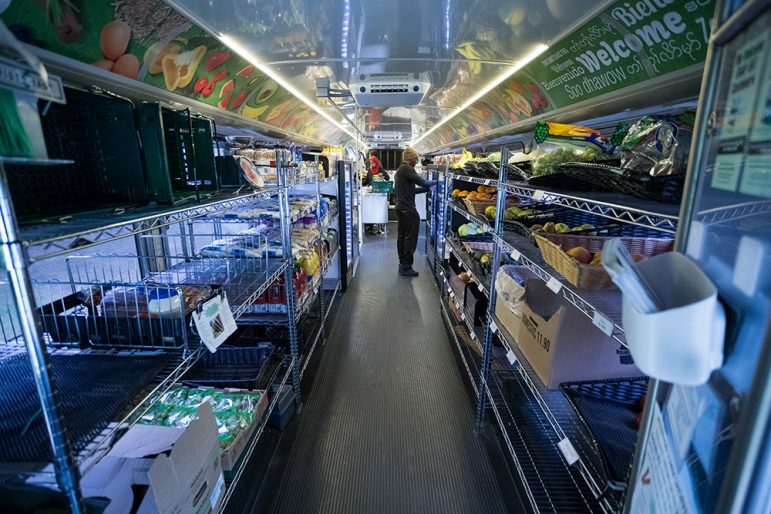 Operating out of remodeled Metro Transit buses, TCMM is a grocery store on wheels created to help the community gain access to healthy food and a healthier lifestyle. The project is the brainchild of Leah Porter, program director at Amherst H. Wilder Foundation. Following up on a concept from her college thesis about adequate access to food in low-income areas, she researched mobile markets around the country and presented the idea to the Wilder Foundation, which launched TCMM in 2014. The program began in St. Paul’s Frogtown, Battle Creek, and Midway areas. By using U.S. Department of Agriculture (USDA) maps to locate so-called food deserts and shopping-specific areas, organizers identified neighborhoods with limited access to fresh and healthy foods. The original plan included Minneapolis but was delayed because of City rules and regulations, explained Filsan Ibrahim, TCMM community engagement coordinator. Once the technicalities were met, Northside and Cedar-Riverside locations were added, and now TCMM serves a total of 20 locations throughout the metro area. Customers typically come from high rises and public housing; they are families, elders and younger, single folks. They include Somali and Hmong immigrants as well as African Americans and Whites. Ibrahim noted the mobile market is particularly helpful for people who find it difficult to get to other stores. “In winter, older folks try not to drive or even go outside. They tell us it’s a blessing for them to come downstairs and shop,” she said. On average, the program serves up to 30 to 40 people per site in St. Paul, where the program originated and people know the Wilder Foundation, said Ibrahim. The busiest and largest location is the Mt. Airy high rise on Fridays. On the other hand, turnout growth has been a bit slower in Minneapolis. Fewer people know about Wilder, so participation averages 10 to 20 people per site at North and Cedar-Riverside sites. Ibrahim added that TCMM differs from grocery stores or food trucks in that customers can shop with the Market Bucks program as well as cash, credit/debit cards or EBT. If they buy fresh vegetables with Market Bucks, they will be eligible to get an additional $10 worth of fresh vegetables. Customers can also use Market Bucks at farmers’ markets. In July, TCMM plans to roll out Fresh Bucks, a new program for North Minneapolis locations, in collaboration with the Wirth Co-op, Appetite for Change, and K’s Groceries and Deli. Residents who buy groceries with their EBT will get half off the total cost. That means $20 in groceries would cost only $10. “Fresh Bucks will be redeemed at all these locations to help our customer stretch their dollars to buy more fresh fruits and vegetables,” Ibrahim said. The mobile market also strives to ensure products are low in fat and sugar. They stock over 100 types of fresh vegetables as well as basic staples such as spices, sugar, flour and beans. Although the purpose of TCMM was getting people to have access to and eat healthier foods, staff found other benefits were “popping up.” As people waited for the market bus to arrive, they were socializing, getting to know their neighbors. “Interaction happens,” said Ibrahim. It’s a chance to network, and for older residents to reduce isolation. It’s also a chance for the community to get involved. Volunteers who can share about an hour and a half of their time are an important part of outreach. They help customers enter the bus, select products, and exit the bus along with other tasks that keep the service running smoothly. TCMM welcomes shoppers three to four times weekly on varying days Tuesday through Friday. For a complete list of market locations and times, or to volunteer, visit http://bit.ly/tcmmmap. Judith Hence is a contributing writer and former editor-in-chief at the Minnesota Spokesman-Recorder. She can be reached at jhence@spokesman-recorder.com.